The Sorento SUV comes with a new 2.4-liter four-cylinder engine making 172 hp and a 3.5-liter pushing 273 hp. LOS ANGELES -- Kia's biggest advertising launch is under way in preparation for the arrival of the 2011 Sorento. The redesigned SUV goes on sale next month. For the first time, Kia has a billboard in New York City's bustling Times Square. Situated on the south end of the square, the board promoting the Sorento will be visible when the famous ball drops on New Years Eve. “So we expect millions of people all over to see the new Sorento,” Michael Sprague, vice president of marketing for Kia Motors America, said yesterday during an interview here at the auto show. The billboard will be up through March. Through mid-January, 60-second commercials will run in 16,000 movie theaters. 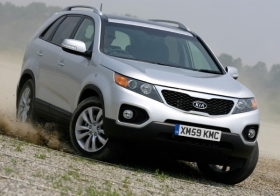 The spots will focus on Kia's new plant in West Point, Ga., where the Sorento will be built. “This is to let customers know that we're investing one billion dollars here and providing 2,500 jobs,” Sprague said. “We want to instill confidence and trust -- that we're here to stay. The Sorento made its North American debut at the L.A. show yesterday. The SUV comes with a new 2.4-liter four-cylinder engine making 172 hp and a 3.5-liter pushing 273 hp. Both are mated to a new six-speed automatic transmission. The seven-seat Sorento is longer and roomier than its predecessor and boasts 5 cubic feet more cargo space. It offers a first for any Kia vehicle: an optional panoramic sunroof. “We're trying to build an image and get away from the cheap brand image,” Sprague said. He would not divulge the ad spending but says the budget is about 60 to 70 percent more than the previous most expensive launches of the new Soul boxy car and the Forte sedan. Kia spent an estimated $40 million to $50 million each on those launches. Kia introduced the Soul in March, the Forte sedan in June and the Forte coupe in November. Kia has been one of the success stories in the United States this year, with a sales increase of 8 percent through November. Total Kia U.S. sales reached 279,015. Kia and its Hyundai affiliate, along with Subaru, are the only major automakers that have registered 11-month U.S. sales increases this year.